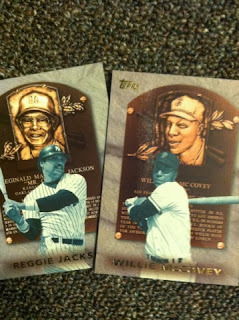 When it comes to redemption cards, I am a very impatient person. So when I found out that one of mine had reached its 4 month limit, I said, no more waiting. So like with most of my redemptions, unless I really want the card, I get it replaced. And the best company to do that with is Panini. 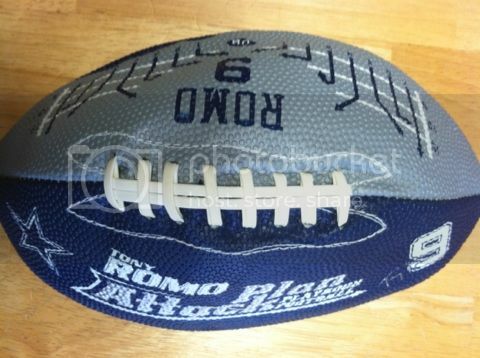 I know some of you may disagree, but as soon as I request a replacement, it's mailed. Stars and Stripes Signatures of Grant Green so I think I won on the exchange. Moore is not only from my favorite team, but is going to be a beast years to come. He has shown potential throughout the season. 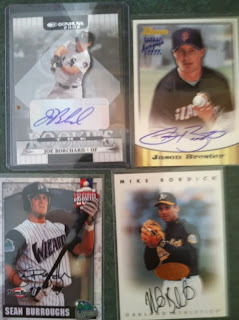 Winner Of The Final Player Of The Day Contest! First off, we wanted to thank you fans for another great year of us hosting the Player Of The Day contest. We truly hope to be invited back again next year! We hope you not only enjoyed the prizes, but the creativity and tons of time we spent putting into the contests. We had a lot of fun along the way with every contest. But as we stated when posting this finale contest, all great things come to an end. And this one, though not as many entries as we had hoped, was a great way to sum up the promotion on here. It was also a close ending as well. We had many picking the Ravens, some went over, some were close but one was straight on. Congrats goes out to Josh who completed all of the steps and got the score of 42 with a Ravens win. Here are the great prizes Josh has won from this contest! Each envelope is filled with 1-5 insert/rookie cards. Some are numbered. Meaning could be close to 50 cards to win as well! 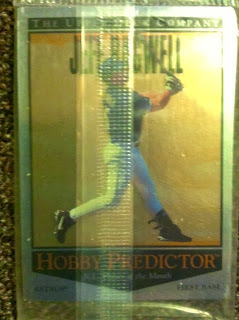 Josh, please email us ASAP your address to sportcardcollectors@hotmail.com. You will have 7 Days from today to claim your prize. If not claimed, we will re-give it away. 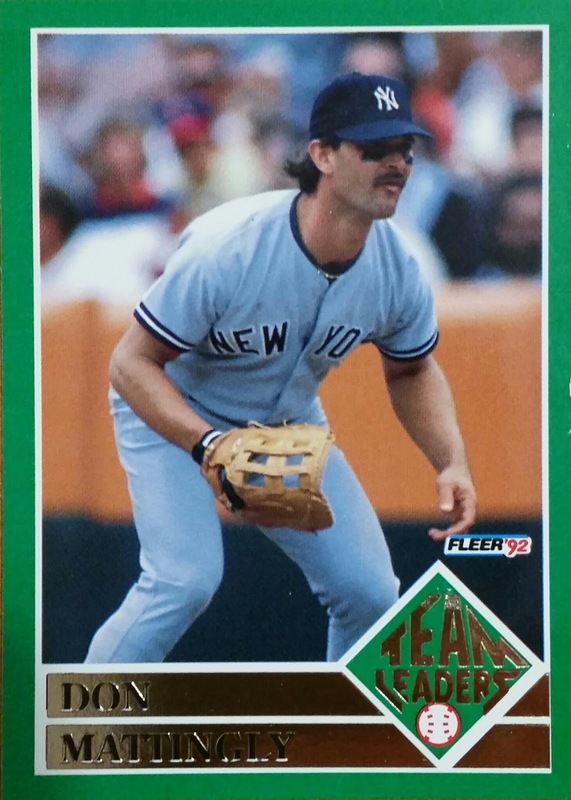 If you have a second Josh when you receive your prize, we would love to have a picture taken of it and you can post it on our Facebook wall, Twitter page or just email it to us at sportcardcollectors@hotmail.com. Thank you in advance! We still will have one more post coming up of Player Of The Day with a fan gallery of you guys showing off your prizes for those who sent us pictures. This post will go up about December 8th 2013. Once again we appreciate all of the time you guys put forth into our promotion. And congrats to all of the winners this year. We look forward to joining in on the 2014 one with an entirely NEW promotion! PLEASE make sure you thank Panini and Panini Player Of The Day on Facebook and/or Twitter for letting us participate this year. 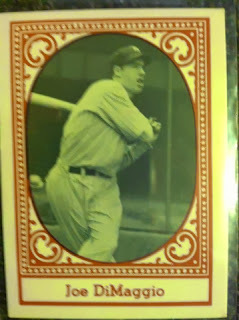 New Breaker On Sport Card Collectors! A few months ago while introducing you guys to The Pack Gambler, we mentioned that they were one of two NEW breakers coming aboard. Now we think it's time to announce the other. Everyone, you have already met our new featured breaker. They have been with us for awhile now. 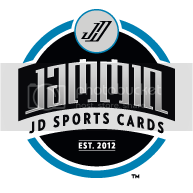 But, we think you should give our friends at Jammin JDcards a huge welcome aboard anyways as they will now be featured breaker on Sport Card Collectors! How can we support two breakers on here you may ask? One, they both agreed to it lol. Two, they both break different sports. 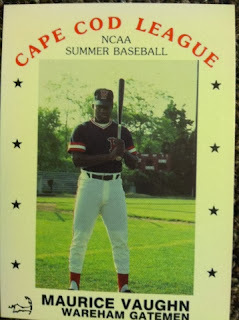 The Pack Gambler puts a focus onto hockey, but also breaks baseball and football. Jammin JDcards will be breaking football and basketball. They also do different forms of breaks with randoms, by teams, etc. Both of our breakers we put our full trust into and we know they will serve you well. We only put the best on here for you guys. Jammin JDcards is new to the breaking world but you guys have been in sort of their preview breaks with the contests they have held on here before. We have seen first hand on Twitter the massive mojo they have pulled from their own hobby boxes, blaster boxes and even a pack or two. 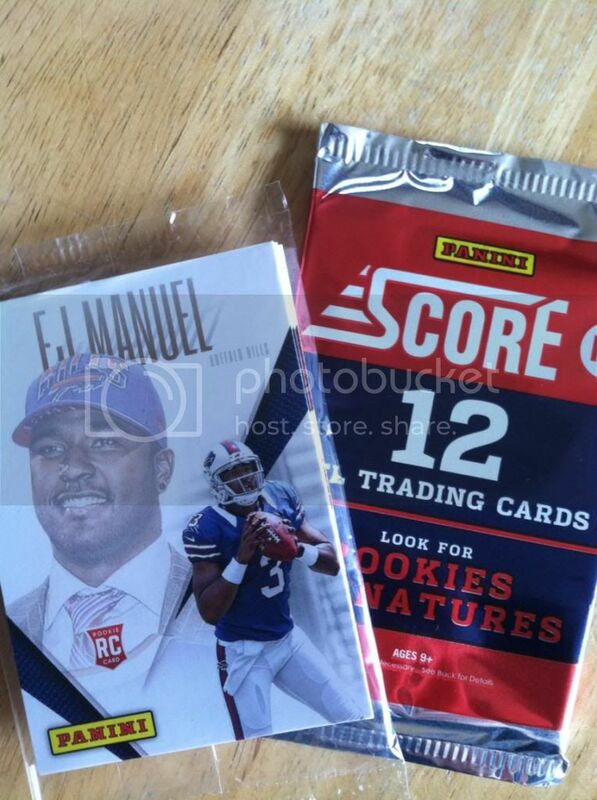 So we can only imagine what they will do in a box break for you guys. They just announced their first two breaks on their new site and it would be great to see some of you guys give them a try. 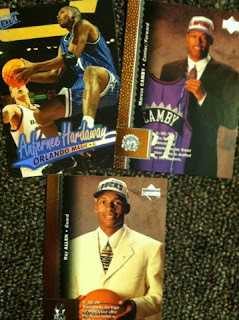 The first break is for Panini Intrigue and Innovation basketball. Only $8 a slot! Done as random teams. You could land Kyrie Irving for $8! 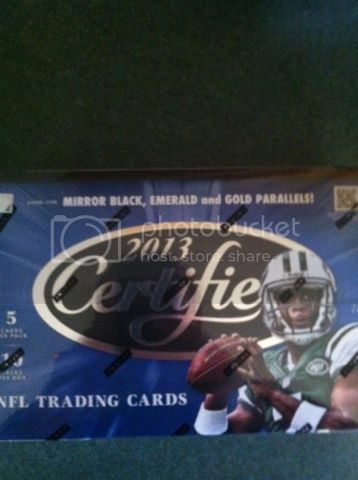 And they are also doing 2011 Panini Gold Standard Football 5 Box Break. This will be done as a..wait for it...crazy random. Yup. Something new to the breaking world. You will get a new team with every box! 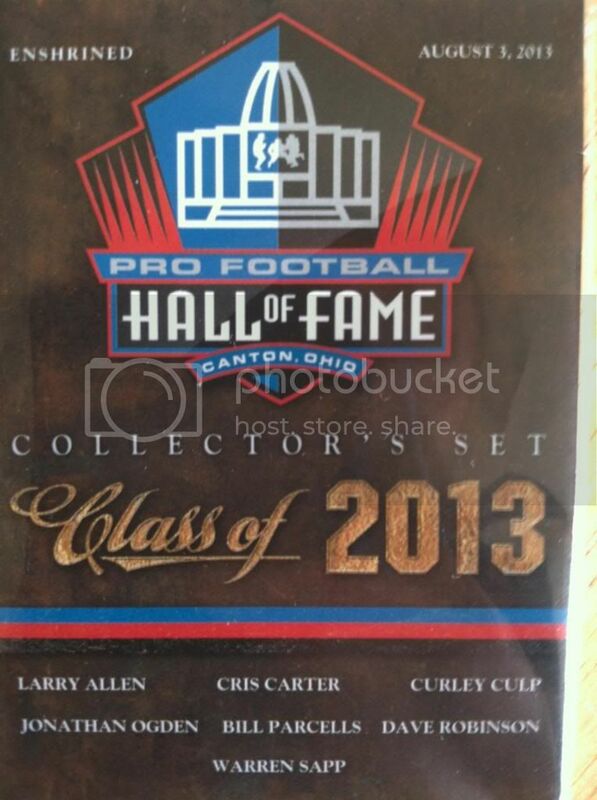 So for $20 you could get Cam Newton and Colin Kaepernick auto rookies! And all of the other goodies that Gold Standard has to offer. Both of these breaks can be found HERE. Try them out! We are sure you won't regret it! 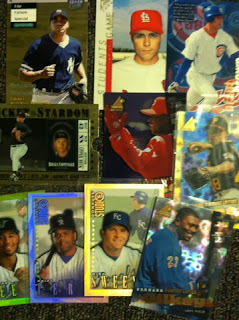 Please give a huge welcome to Jammin JDcards and we wish them success on their upcoming breaks. You can also follow them on TWITTER and Like them on FACEBOOK if you have any questions about their upcoming breaks. Here is a list of five things we are thankful for this year. If there is something you are thankful for, please feel free to leave it in comments. First and foremost, we am thankful for God and a great family. we very blessed to say the least. That's what matters most. Secondly, we am thankful for the success this blog is having this year. Seems this once underdog site, is getting more into collectors eyes daily. This blog is only going to get better! 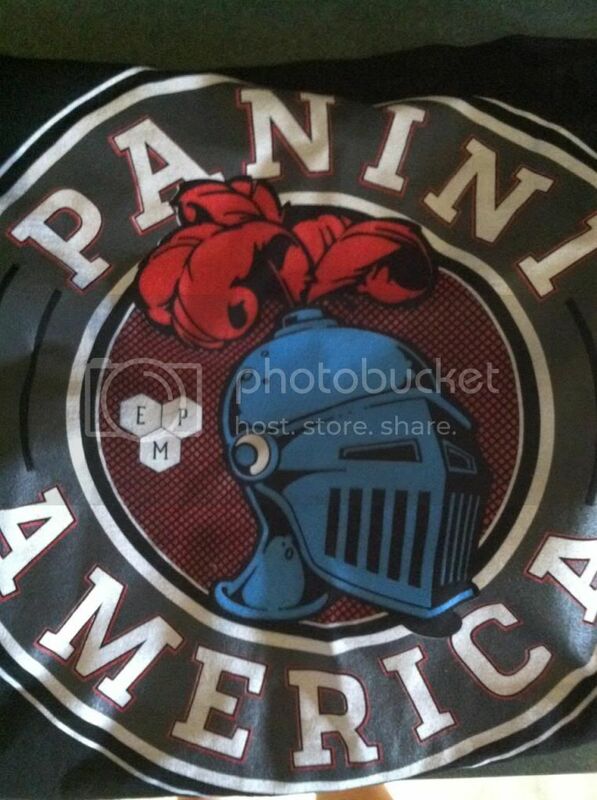 Thirdly, we are thankful for Panini America and their continued support of this blog. Without them, we wouldn't have reviews, previews and the amazing giveaways or even a blog. Also, we wouldn't have the Player Of The Day promotion that we know you guys all love! 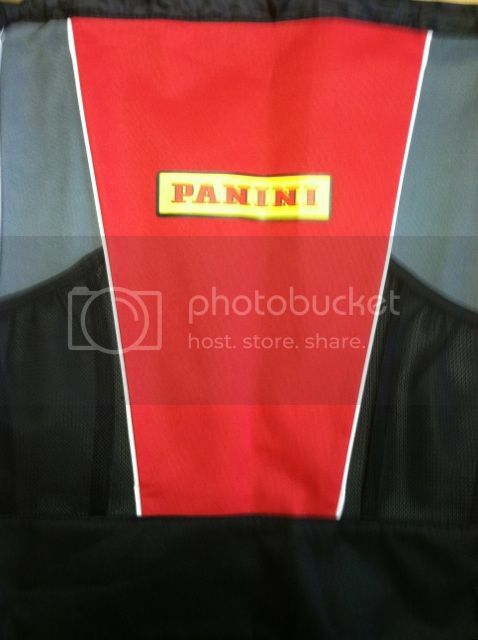 Panini is doing great things for the hobby with their Customer Service, products, promotions, and their fan interaction. Not to mention, they strive daily to improve. They get our support 100% and we hope you give them the same. We would be very thankful if you guys gave them recognition for this. They are the foundation that keeps this blog going! Fourth, we are thankful for new friends of the blog this year. 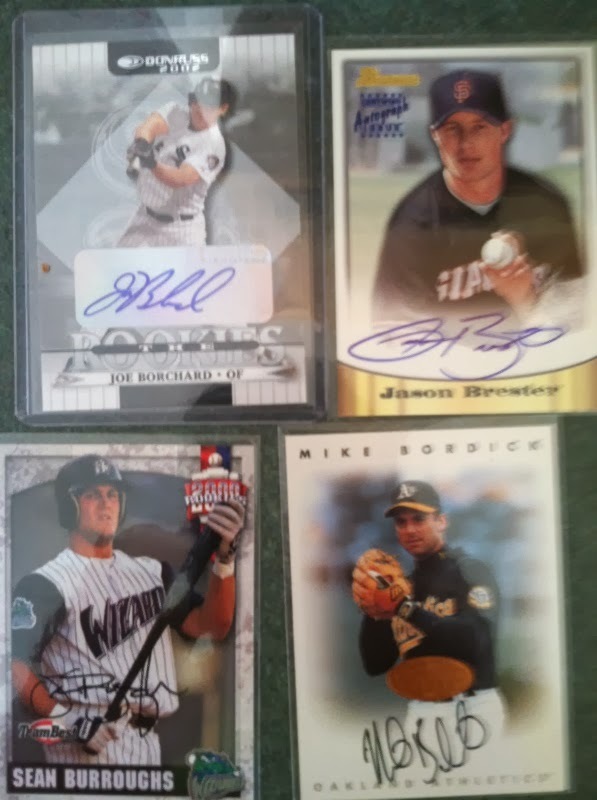 Jammin JDcards and The Pack Gambler have been not only great for the hobby, but have been great for our blog base with their giveaways, box breaks and storefronts. They are also tremendous individuals to speak with. We hope you guys are following them on their sites, Facebook or Twitter. Fifth, we are truly thankful for some amazing fans of the blog.Without you guys...this blog wouldn't survive. Need you here daily to enjoy reading stories, reviews, card posts and more. And sharing your thoughts and most of all for putting in great efforts like you did for our 2013 Panini Player Of The Day promo! Thank you! So this holiday, we hope you all spend time with your families, eat til your hearts content, and watch as much football as you can. But most importantly, make sure that you are thankful for everything big or small. Happy Thanksgiving from us at Sport Card Collectors! Usually when it comes to trading, I am more of a hoarder than a trader. I just can't let anything go. And in a world where you can't trust everybody especially when it comes to trading, I usually steer clear from it. 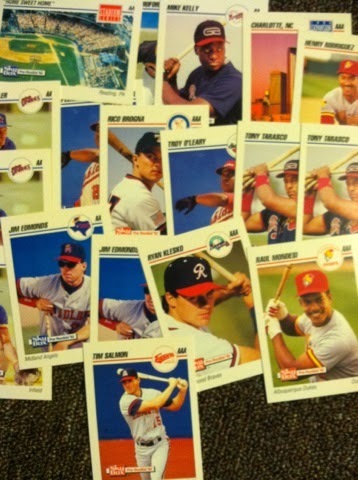 But when Sport Card Collector fan Miami Vice approached me about a trade I decided to do it. Not only because of what he was offering, but I knew I could trust doing one with him. And I am glad I made the trade. Man I truly like the Crusades! Big play against the Raiders in the blocked punt return for a TD. Overall, was a great trade for the both of us. And I would recommend trading with him if he ever approaches you for a trade. Thanks again goes out to Miami Vice on this mail day and trade! As always your thoughts are welcomed! This is about a few weeks due shout out to Frameworth who we won a contest from on Twitter. Every few weeks (or when they have a signing with a player or players) on Twitter and Facebook, Frameworth gives away product just for following, liking, RTing or being the person who interacts with them the most. 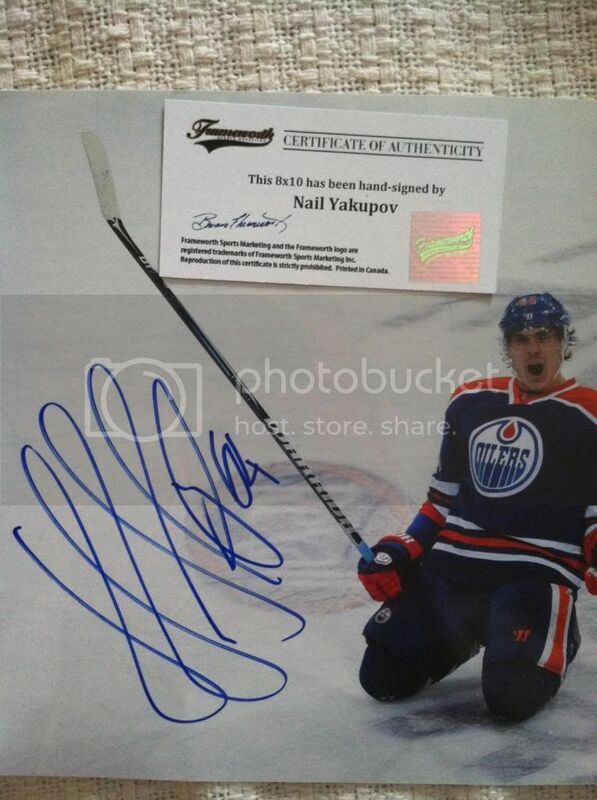 They have given away big time autos of stars Sidney Crosby, John Tavares , Wayne Gretzky (who I was really aiming to win an auto of being a Rangers fan and a Gretzky one) and of recent first overall pick Nail Yakupov who is we landed, among MANY more. A big thanks goes out to Frameworth for the contest and the great prize. We not only love the unique signature that he has, but the photography used for this photo is outstanding. We will continue to follow and interact with you on Twitter and hopefully in the future win a Gretzky auto to have as a centerpiece to our collection. But once again, thanks for this great prize! It will be hanging on our wall for years to come! We recommend that everyone goes and either follows them on Twitter or finds them on Facebook. And if you are looking for some of their great items go and check out their website that you can locate HERE. 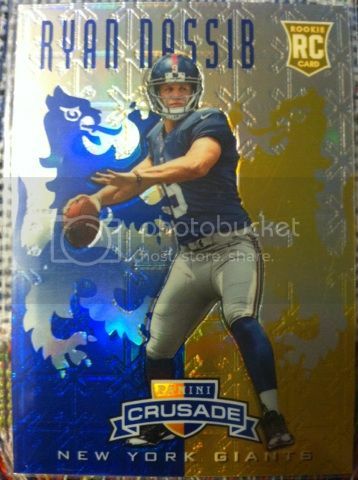 Here is our ELEVENTH entry into the NY Giants/Panini America Promo Contest! The Week 10 of our contest victory goes to Whitley Gilbert who guessed the score of 45 when the total of the Giants/Cowboys Game was 45. 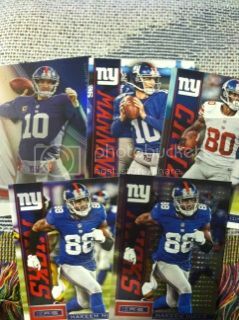 With the Giants horrible loss, no cards will be added to the pot this week so we are still at 6 cards. With a win over Washington this week we will bump it up one more so keep rooting on the Gmen! With that loss against Dallas I see their playoff chances are slim to none at this point. Not the season I thought I was going to be viewing, but it's the NFL, you never know! *CONTEST ONLY OPEN TO U.S. RESIDENTS ONLY! SORRY! We hope you all enjoyed Round 2 of our Scavenger Hunt! 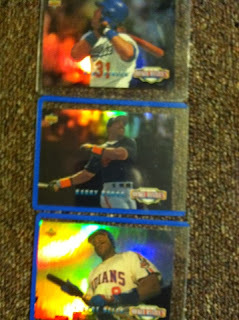 Here are the THREE CARDS you were looking for. Like we stated, look closely. You can tell by our poor Photoshopping skills which ones they are. Some were still harder than others. But seems like most of you found this one much easier than our first scavenger hunt. If you said these three cards, Jared Cook's auto was changed, Calvin Johnson was missing the JR, and Julius Peppers is missing the Player Of The Day logo than you are in the running for the big prizes!! So if you had Reggie Bush or Ryan Broyles cards being gone in you answer with a combination of the ones above they will count as well. After THREE RANDOMS on Random.org the following winners names popped up! 1ST PLACE PRIZE goes to Jessica P.
Congrats to our 3 winners!! And thanks to everyone who participated. 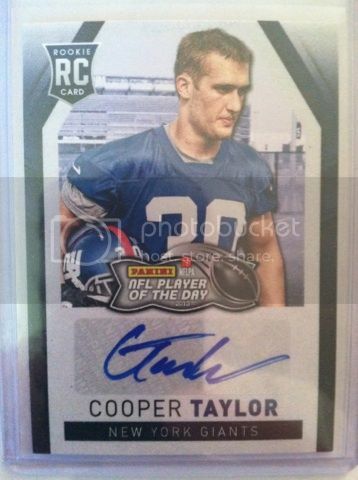 one more Player Of The Day Contest going on right now! Really easy to enter! 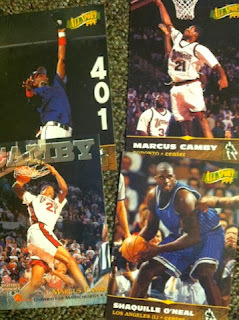 Winners, please email us at sportcardcollectors@hotmail.com with your addresses! 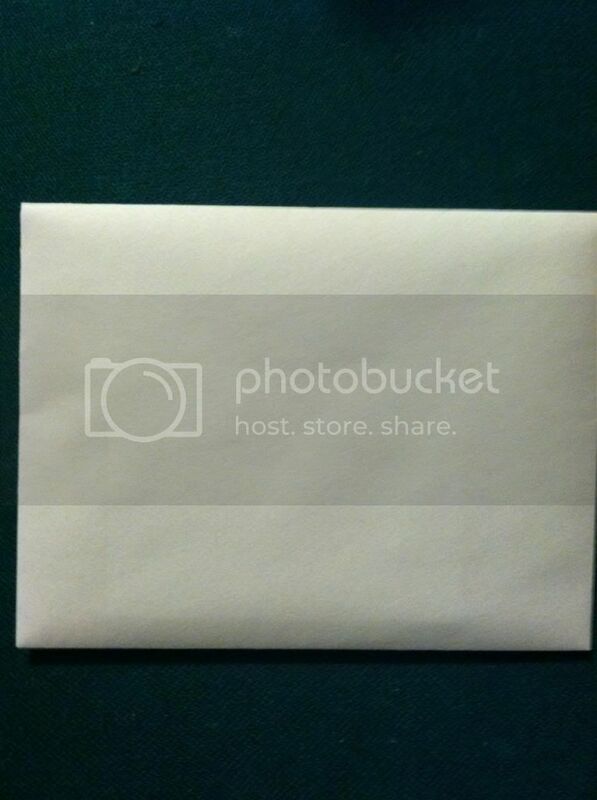 We will get these right out to you as we want you to receive your prizes as fast as possible. All we ask in return is that you please email us pics of when you receive the prizes or at least show us your hits! This would be greatly appreciated. You can post pics on our Facebook wall, Twitter or email them to us to the above email. Thank you! 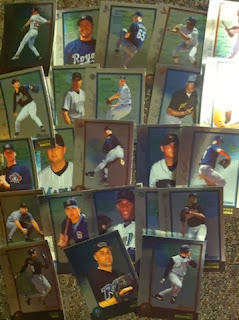 Yard Sale Find # 20 FINAL BOX FINALE PT 3: The 31 Hits! This is it. The finale of our Yard Sale Find series that took 20 posts to break it all up. 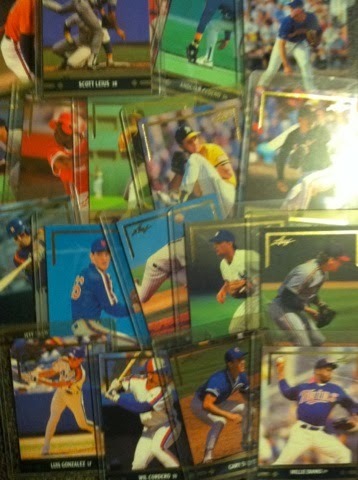 Remember, we got all of these cards for all 20 posts for $30. And we can finally say we got a steal. 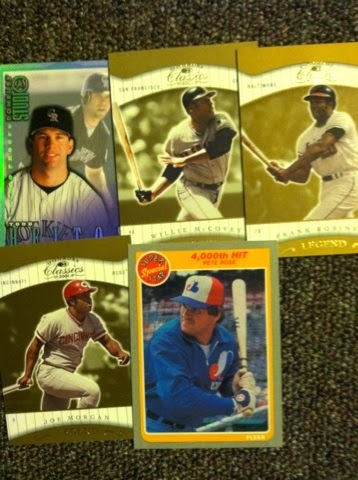 In the final box that we showed off in the last two posts, we also found all of these embedded below. 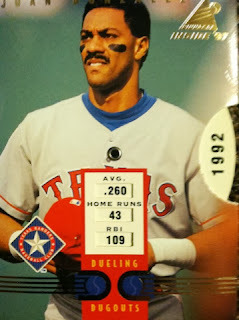 Did we expect to find this many hits? No. Not at all! We expected to get mostly base cards, few rookies and maybe some inserts. But that's not at all what this yard sale find came packing with. To me, I would much rather pull a bat card than a jersey card. 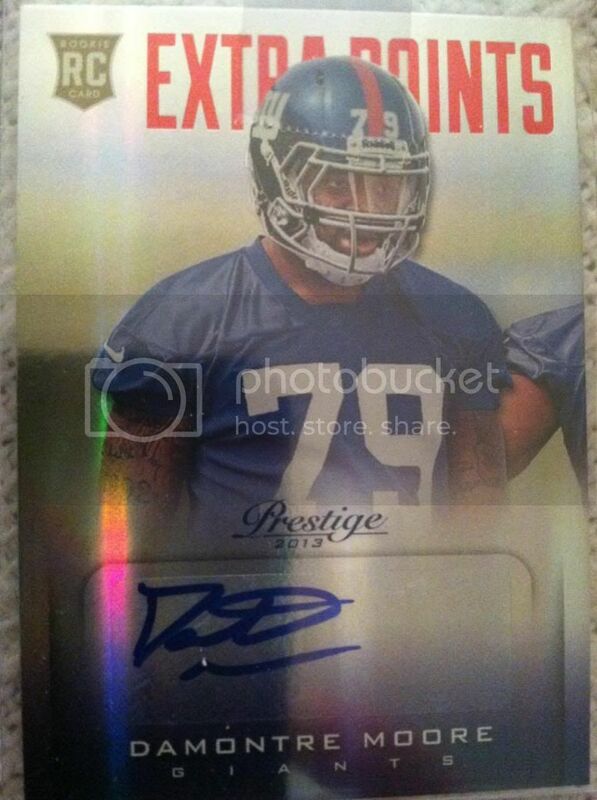 So many jersey cards out there. Finding these bat cards were a great addition. RAUUUUUULLLLL!!! 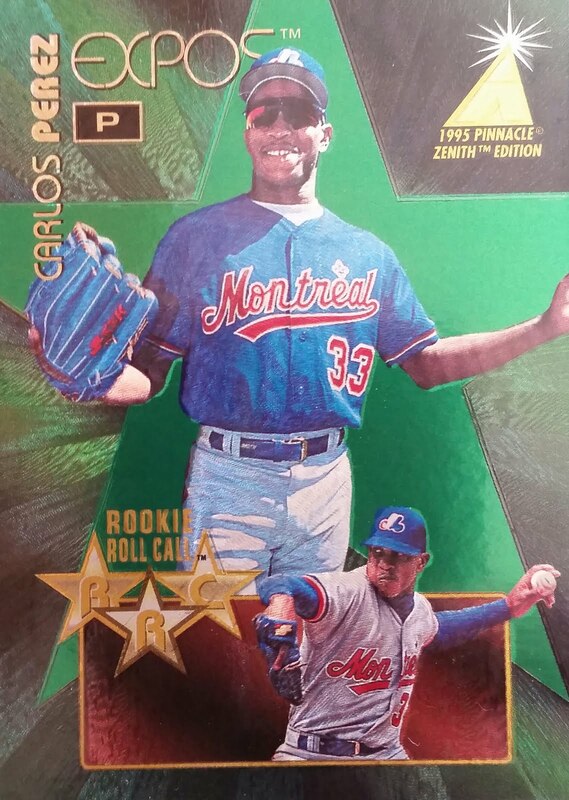 It's an Buy Back Upper Deck card. 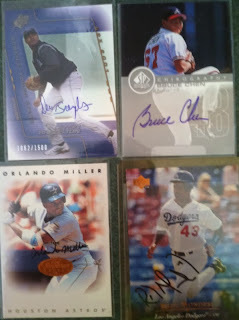 Most of the autographs we found were also on card! 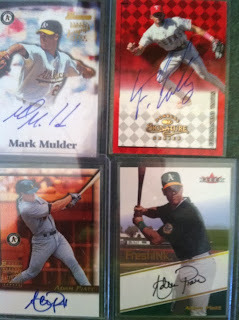 Really like the Mark Mulder find. 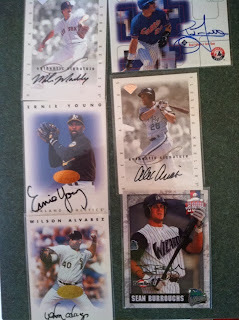 And I remember picking up Donruss Signatures, very popular autograph cards back in the 90's. 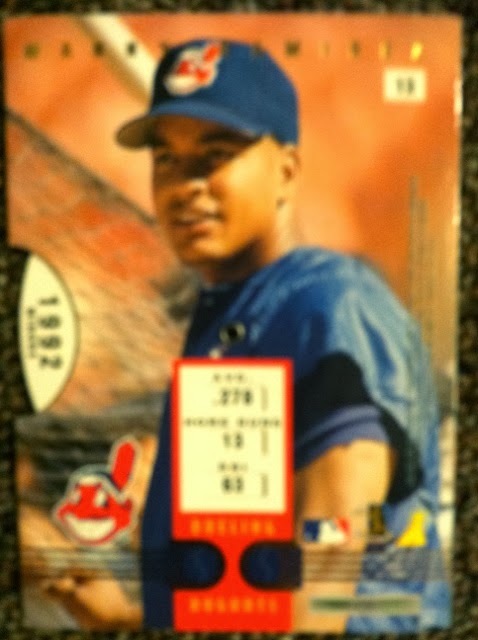 Kenny Lofton is signed on card without authentications. The yard sale person must have run into him somewhere. 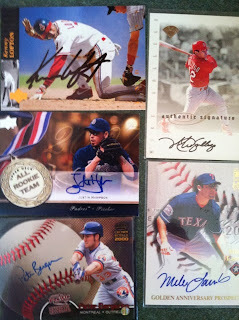 We were quite shocked to find 26 autos and 5 memorabilia cards. What a way to end what was already an overly impressive yard sale find!! We really enjoyed seeing all of these hits hidden within. You would be a fool not to say we really did well with this yard sale find. 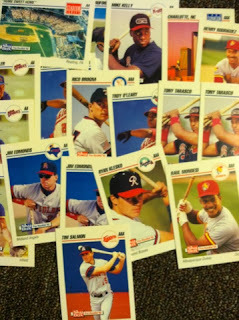 With all of the inserts, rookies and the 31 hits we would have to say $30 very well spent! This person also has TONS more for sale and is having another Yard Sale next year..so don't be surprised if we don't return and bring this series back next summer. Let us know your thoughts on our entire Yard Sale Find series and especially right here with the finale. 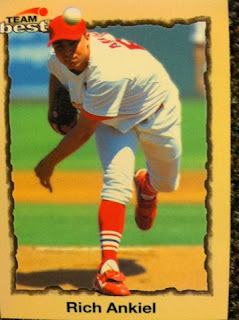 Tell us your favorite cards from our find, if you liked the series and more! We would also love to hear your great finds at a yard sale as well. Hopefully next summer we can find another great yard sale to share with you guys! FINAL PLAYER OF THE DAY CONTEST! 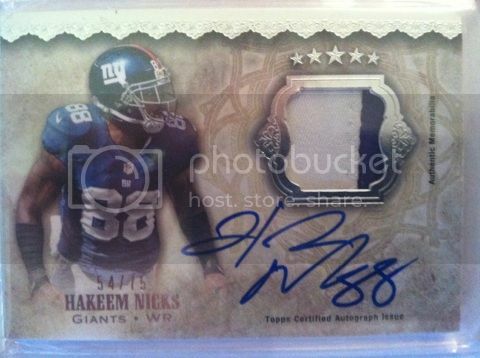 Another great year of the Panini Player Of The Day Contest and we hope all of you enjoyed. But as with everything, all great things must come to an end. 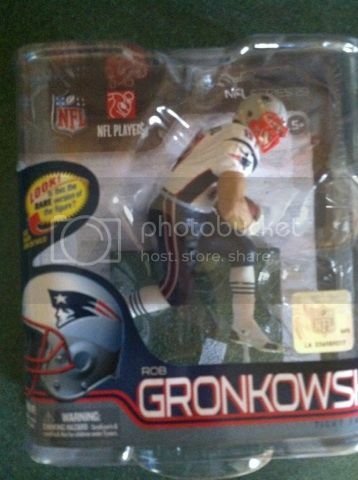 So here is our FINAL Player Of The Day Contest for 2013. We wanted to make this one a bit simpler. And just to get some feedback from you guys. This takes no time to enter and is simple as can be. Here are the great prizes you can win from this contest! There will only be one winner in this contest. Now onto how to enter. 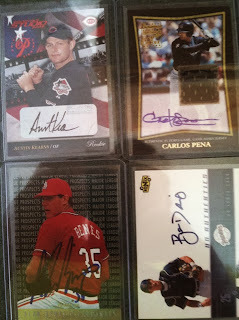 First off, visit Panini's Blog THE KNIGHTS LANCE. Tell us something about the blog you enjoy. Secondly, visit the PLAYER OF THE DAY WEBSITE tell us your thoughts on the site and if it's easy to use or not. Third, Tell us your thoughts on Panini's Player Of The Day promotion. Fourth, Tell us which POD participating shop name and state is closest to you by using the Shop Locator located HERE. Fifth, tell us if you were to win a DAY WITH A PLAYER (what this promo is all about), which player would it be? And last, just so we don't have to random this. Pick the winner of the Thursday Night Football game between the Steelers @ Ravens and total points of the game WITHOUT going over. 2. Really easy to use and navigate. 3. I really like what Panini does...just wished I had an LCS nearby. But thank goodness Sport Card Collectors blog has helped me participate! Entries will be due in by Thursday November 28th by 8:30 pm e.t. All entries will be hidden for the fun of the contest. Winner will be decided by the last step but you must complete all steps to have your entry considered. Good Luck and we hope you have enjoyed our 2013 version of Player Of The Day!! Thank you to everyone who enters! Final winner will be announced November 29th. We apologize as a picture of the white box wasn't taken before we dug in. This is the second side of the box. 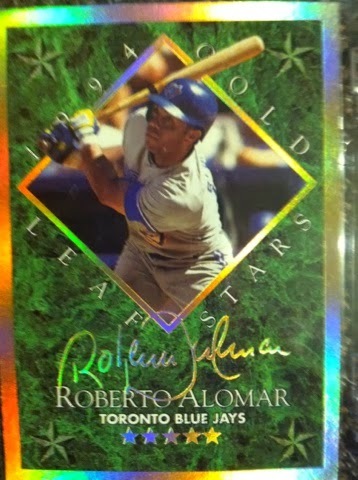 I remember busting so many packs of Upper Deck baseball 1997 hoping to land one of these. Now I spend one little amount at a Yard Sale and it's mine. What are the odds...just glad I have one now. 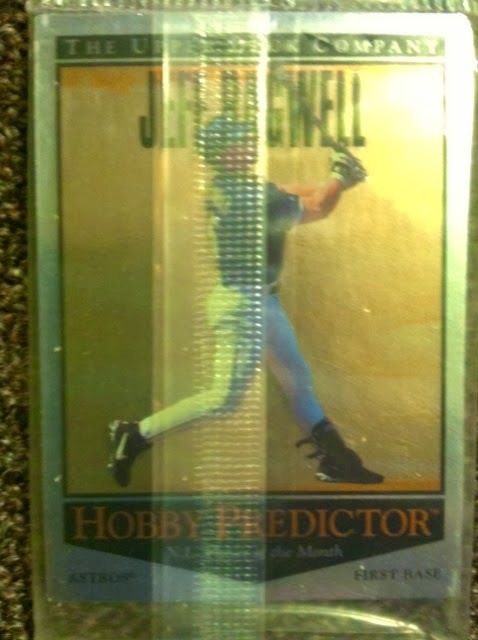 Dual sided insert card found only in Pinnacle Inside (yep, the cards in the can), you can turn the year dial on the side of the card to view stats of every year. 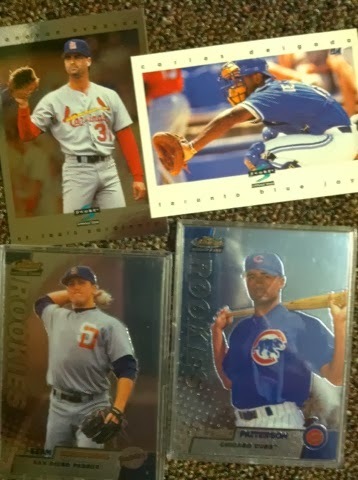 Bowman "fillers" as I like to call them. Sweepstake entry cards is what they truly are. Really liked the design on these. 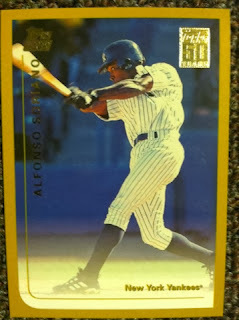 I totally dig what Topps did here for design. Loved this parallel pile. Despite buying tons of Pinnacle Inside, yup once again cards in a can, I filled a can set but never pulled any of the cool parallels like the Diamond Edition. Overall, second side was as good as the first.. 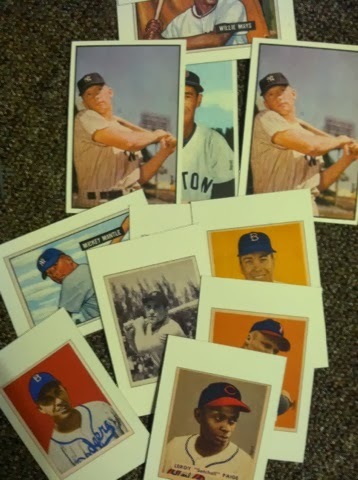 Ton's of inserts again. Some prospect and rookie cards in there as well. 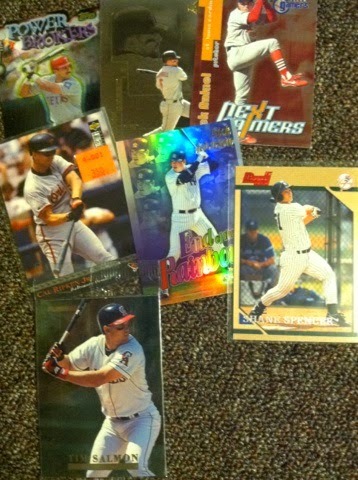 We also discovered some base cards of star players we didn't take pics of. We tried to narrow it down. 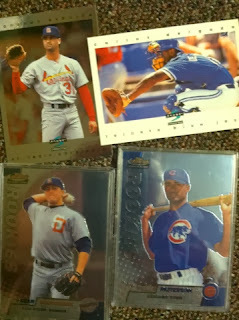 We even found some 2008 Topps base cards (roughly two packs worth) which is the newest cards we found in everything as most ranged from 1990-2002. They must have tried to dive back into the hobby or had a pack opening craving. Must not have caught back on again. 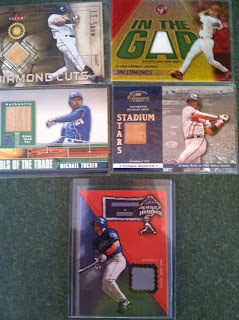 Favorite finds of this side of the box, the parallel inserts. The rookie card of Alfonso Soriano. 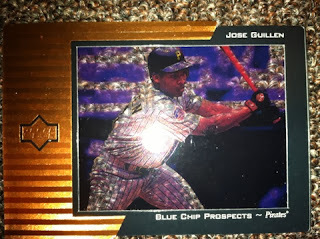 And the Blue Chip Prospect. But over all pretty happy with all of the finds. One final post to go from this ONE Yard Sale find this summer. What a ride it has been. But with most things, we saved the best for last! Feel free to comment on this post as well!